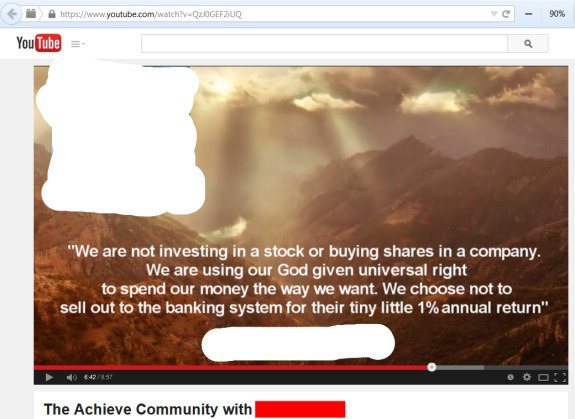 From a 2014 YouTube promo for The Achieve Community. Authorship is unclear. Still promoting your securities scam on YouTube? As the PP Blog reported on Oct. 3, YouTube promos for the alleged DFRF Enterprises’ Ponzi scheme were cited in two of three wire-fraud counts against accused operator Daniel Fernandes Rojo Filho. Filho, allegedly at the helm of a fraud that gathered tens of millions of dollars, has been in federal custody since his July 21 arrest in Boca Raton, Fla. The office of U.S. Attorney Carmen Ortiz of the District of Massachusetts is prosecuting the Filho criminal case, and the SEC simultaneously is prosecuting a civil case. The SEC has warned for years about securities scams spreading on social media. It turns out that YouTube videos also are playing a role in the criminal prosecution for wire fraud and wire-fraud conspiracy of Troy Barnes of The Achieve Community — or TAC. That prosecution was announced Nov. 3 by the office of U.S. Attorney Jill Westmoreland Rose of the Western District of North Carolina. Among other things, the indictment against Barnes alleges that “YouTube communications” played a role in duping Achieve participants and therefore constituted part of a wire-fraud conspiracy. Barnes, 53, resided in Riverview, Mich. He is free on bond, pending trial. In addition to the conspiracy count against him, Barnes also faces three counts of wire fraud for three transactions in 2014 involving the purchase of Achieve “positions” by victims, according to the indictment. Barnes co-conspirator was Kristi Johnson, 60, who resided in Aurora, Colo., prosecutors said. She has already pleaded guilty to wire-fraud conspiracy and is scheduled for sentencing Nov. 19, before U.S. District Judge Max O. Cogburn Jr. Achieve offered a 700 percent ROI, according to the SEC and federal prosecutors. Barnes and Johnson also face a civil action by the SEC. Scammers from AdSurfDaily in 2008 tried the same tactic. It backfired, as it later would do with Achieve and other “programs,” including Zeek Rewards. The PP Blog’s Achieve coverage received a mention Nov. 3 in the Charlotte Observer. See the Blog’s archive of Achieve Community references. 1. Pursuant to Local Rule of Criminal Procedure 55.1, Ms. Johnson respectfully requests this Court to seal the Joint Motion to Continue Sentencing because it contains sensitive information regarding a criminal investigation. 2. Public dissemination of the Joint Motion to Continue Sentencing may interfere with the administration of justice. Therefore, there is good cause for the Court to seal said motion. Story above updated to reflect that Kristi Johnson today asked for a delay in her sentencing, currently scheduled for Nov. 19.